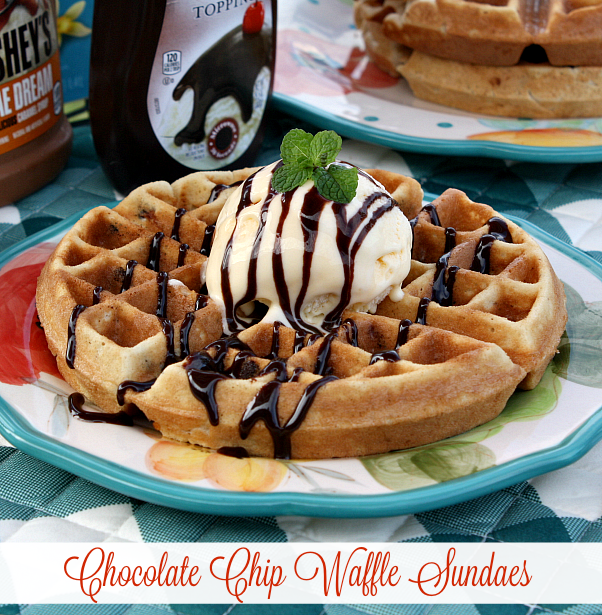 Warm gooey chocolate chip waffles made, with a MarthaWhite® muffin mix and topped with your favorite ice cream sundae toppings. Everyone mark your calendars and get ready to celebrate Country Musics Biggest Night™!!!!! 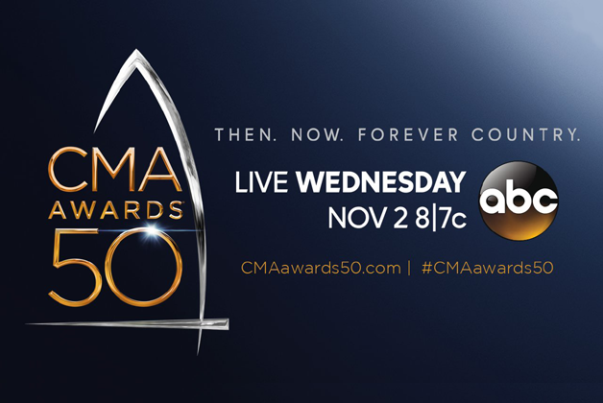 The 50th Annual CMA Awards will air on November 2nd at 8:00 p.m. EST on ABC. You don't want to miss the show because the Country Music Association is celebrating 50 years of country music and I can't wait to see what they have planned. It should be an awesome night filled with epic performances from all your favorite country music stars. Last year I had the once in a lifetime opportunity to attend the CMA Awards Live in Nashville, TN with my Martha White family. All I can say is it really was a night to remember. Martha White has partnered again this year with the Country Music Association for their 50th Annual CMA Awards. I won't be attending the awards this year, but I will be watching the CMA's from the comfort of my home and I can't wait. If you love country music as much as I do, I think it would be a fun idea to invite friends and family over for a viewing party complete with, appetizers, party foods and dessert of course!!!!! A neat idea would be to have a dessert bar so you can please every one's sweet tooth. These Chocolate Chip Muffin Mix Waffles pictured below are a delicious idea that I think all your guests will love. 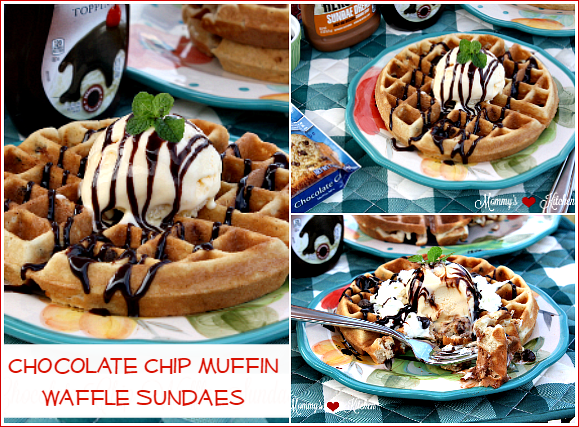 I used a Martha White chocolate chip muffin mix to make the waffles and then added all my favorite sundae toppings. I dressed my waffle sundae up with hot fudge, whipped cream and chocolate chips, but feel free to experiment with your own flavor combination. You want to make sure to gather all your waffle and sundae essentials and set them up in one area. Place the waffle maker in an ideal spot on your dessert bar so everyone can make their own waffles. Make sure to have the muffin mix batter prepared, lay out all of your themed tableware, napkins, arrange the ice cream (on ice so it doesn't melt), sundae toppings, fruits, nuts, cherries and sprinkles so everyone can easily assemble their waffle sundaes. Once everything is set up just sit back, relax and let everyone enjoy their waffle sundae creations while you watch the show. If you're looking for a few other appetizers and dessert ideas for your viewing party, then check out the following recipes. 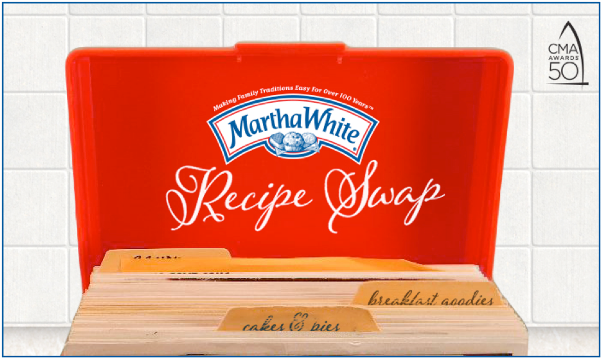 Below is a list of bloggers who are participating in Martha White's Virtual Recipe Swap! 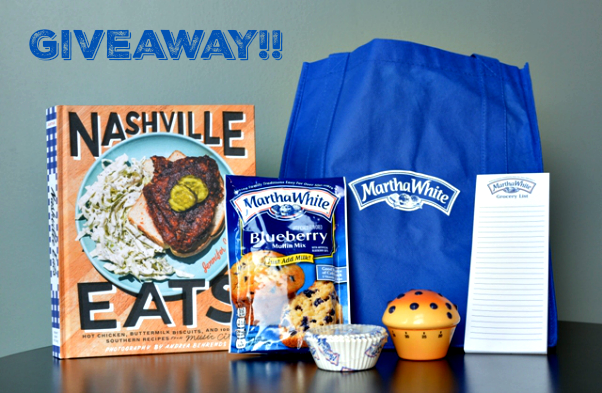 Each blogger is showcasing a recipe using a Martha White product and sharing it with you. I hope you'll take a moment and stop by each of their sites and take a peek at their recipe swap creations. This recipe is easy peasy to make and only calls for 4 ingredients. 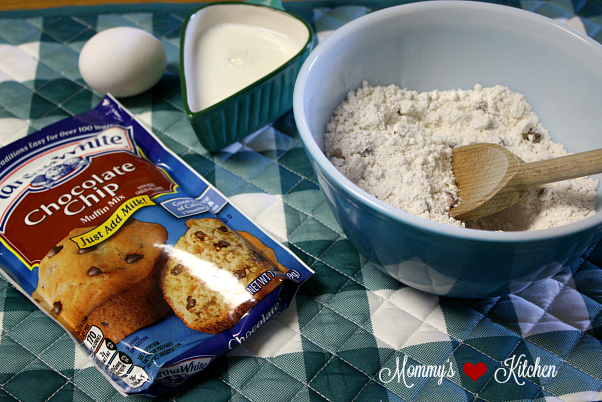 Martha White Chocolate chip or chocolate chocolate chip muffin mix, eggs, milk and vanilla extract. That's it!!! These waffles bake up nice and fluffy on the inside and golden brown and lightly crispy on the outside. Add all of your favorite ice cream sundae toppings and dig in. 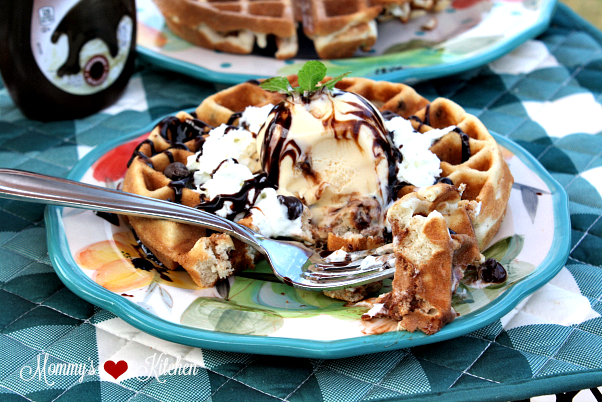 I hope you'll give these ooey-gooey waffles sundae a try for your next get together or party. How To Enter: Leave a comment on this post telling me which muffin mix variety you would use to make waffles. Rules: 1 random winner will be chosen and notified by email (winner will have 48 hours to reply to winning email or a new will will be chosen). Contest is open to US Residents only due to shipping charges. If you comment anonymously please leave your email address in your comment so I can contact you in the event that you are the winner. Good luck to everyone who enters. Preheat waffle maker to medium to med- high heat. While the waffle maker is warming prepare the muffin batter. In a medium size bowl, combine the muffin mix, eggs, milk and vanilla extract. Mix until blended. Brush some shortening onto each side of the waffle maker to prevent the waffles from sticking (do not use baking spray as it leaves a sticky residue on the waffle maker). Add approximately 2/3 cup muffin batter to the waffle iron and cook according to your waffle makers manufacturers instructions. Remove each waffle carefully and do not over bake. Serve with a scoop of vanilla ice cream and your favorite ice cream sundae toppings. Cook's Note: If you're looking for an easy and delicious homemade vanilla ice cream recipe, try my easy No Churn Vanilla Ice Cream. I think that I would use the same mix as you did it sounds so good! You had me at 'waffle' ;) Love these Tina! This is such a great idea! I like any excuse to eat ice cream! 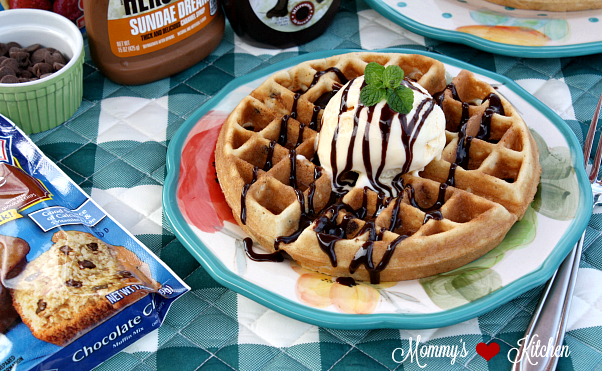 I love the blueberry & I think this would make amazing waffles! I would make mine with the chocolate chip cookie mix also! Looks yummy! I would use Chocolate Chocolate Chip, because the more chocolate, the better! The pumpkin spice muffin mix would make a very unique and very seasonal waffle. The waffles look delicious and what a better excuse to have ice cream with chocolate sauce as well. I think I would try the Apple Cider mix. I would try the Blueberry Muffin mix! I think it would be especially fun to try these with chocolate chocolate chip muffin mix. Yum. I think chocolate chip muffin mix is the best choice! enjoy your recipes and hope I win, but I live in Canada! I think I would chose the apple cider one. These look so great. I'd use the apple cinnamon muffin mix - yum! I would choose chocolate chip - sounds yummy. My families favorite Martha White muffin mix is blueberry cheesecake. I know for sure that would indeed be great for this recipe. I would use either the apple cinnamon or sweet potato muffin mix. Yum! I would use blueberry cheesecake! With blueberry syrup, your sugar rush should be good through lunch! Thanks for the great recipes.! I think I would have to stick to the chocolate chip mix as well. They look delicious! I love them all -- for my family they would love the chocolate chip ones I'm sure. I would most definitely use the Blueberry Muffin mix to make my waffles and include fresh/frozen blueberries as a topping. We love blueberry muffins in my family. I would try the Apple Cinnamon Flavored Muffin Mix. Blueberry would be my choice! The Apple Cider or Strawberry Cheesecake would be fun to experiment with. Gotta go with blueberry. Thanks for the giveaway. Blueberry muffins are my favorite, so I would use the Blueberry muffin mix to make waffles. Chocolate chip or strawberry. Love both flavors. Maybe combine them. Chocolate chip or blueberry muffin mix. Yummy, Yummy! I would use the chocolate chip muffin mix to make waffles. I would use the blueberry muffin mix for making some waffles! I would love the chocolate chip. It would bring back memories of my Mom's chocolate chip pancakes,always a favorite of mine. Yours look great but I would use the Blueberry as I love Blueberry waffles , pancakes, and muffins ! I'd make waffles with the cranberry orange muffin mix. My kids would love it if I used the chocolate chip mix. Oooooooh my gosh, why have I never thought of this. Sweet Maple Cornbread would totally be my jam! I can never get enough chocolate, so I'll go with Chocolate Chip. I'd use the chocolate chip kind!